The Greenwich Concours is a two-day event that features American built cars on the first with International cars on the second. Popular Hot Rod and Custom Car classes were showcased on the first day, along with Muscle Cars, Brass Era, and Classics. There was a special reunion of Cannonball Outlaw cars in attendance. A group of original outlaws depicted in the 1981 film 'Cannonball Run' came together in one place to recount those outrageous stories of beating the law as they raced cross-country from New York City to Los Angeles in some of the craziest vehicles built for the endeavor. This marked the third reunion since the first car took off from the Red Ball Garage in New York City in 1971. There was certainly something for everyone with nearly every generation of car in attendance, from the Horseless Carriage and Brass Era cars, to the modern Super and Hyper cars. Spectators and enthusiasts lined the streets of the entrance to the Roger Sherman Baldwin Park (where the event is held), with camera's in hand, waiting to see their favorite vehicle come rolling along. They arrived hours before the show began and stayed until the final car had left the field. The four cars that seemed to get the most attention were the one-off Ferrari P4/5, a Bugatti Veyron, Lamborghini Centenario, and the Pagani Huayra BC. The Pagani and the Centenario, in my opinion, were the clear favorites. The oldest car in attendance was a 1901 Locomobile Runabout Steam Car that drove onto the show field under its own power followed by a cloud of steam. A 1922 Detroit Electric, powered by seven large car batteries, also drove under its own power. The car reportedly has a top speed of 30 MPH and has a range of over 90 miles on a single charge. The Sports and Racing category housed nine Corvettes, including one of three racing 'Purple People Eater' 1959 Corvettes, and a 1969 Baldwin Motion Phase III Corvette - one of only eight produced. Also in the group was a 1968 Corvette that had been part of the NART racing team in 1971 at LeMans. Among its accolades is a class win at Daytona in 1972 and a 3rd overall finish. The car selected as Best Of Show was a 1935 Packard Dietrich Dual Cowl Phaeton owned by Al & Sandra San Clemente. 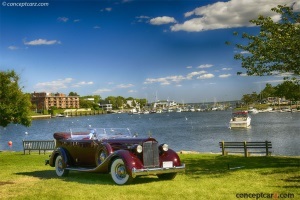 The People's Choice Award was bestowed upon a 1931 Cadillac 452A Phaeton owned by Charles Gillett.